In Runcorn, we produce chlorine (Cl2) and ethylene dichloride (EDC), two essential intermediates for the production of PVC. The other key product is caustic soda (NaOH), a basic chemical used by our customers to make a wide range of end products for daily life. The Runcorn site features a state-of-the-art membrane electrolysis plant for conversion of brine solution (common salt dissolved in water) into chlorine. The plant was commissioned in late 2005 and is operated in a 50/50 joint venture with Inovyn under the name of Runcorn MCP Limited. In a second plant, the EDC Manufacturing Asset, we use ethylene (supplied directly by pipeline) and chlorine to produce EDC. That EDC is shipped to the Vynova site in Wilhelmshaven (Germany) and to customers worldwide. In Wilhelmshaven, we use the EDC to produce vinyl chloride monomer (VCM), the basic building block to make PVC, a high-quality material that our customers convert into a host of end products. Situated on the banks of the River Mersey, the Runcorn site is connected by waterways to the Irish Sea. It is also very close to the UK Motorways M56 and M6, providing it with excellent access to logistic facilities and export markets. As a responsible manufacturer, Vynova Runcorn is certified for the ISO 9001 (2015) quality management standards and the ISO 14001 (2015) standards for environmental management. The site is acquired by International Chemical Investors Group (ICIG). Vynova is founded. The new company comprises the Runcorn site as well as sites in Tessenderlo (Belgium), Wilhelmshaven (Germany), Mazingarbe (France), Beek (the Netherlands) and an affiliated site of ICIG in Thann (France). The VCM and PVC plants in the UK, as well as the Atlantik Cell room in Germany, are shut. The Runcorn asset is converted to EDC production only, with the key aim of supplying the Wilhelmshaven plant. Commissioning of a state-of-the-art membrane electrolysis plant for the conversion of brine into chlorine, currently operated in a 50/50 joint venture with Inovyn. INEOS takes full ownership of the EVC Group including the VCM and PVC plants. INEOS take ownership of the ICI assets at Runcorn, including the EDC1 and EDC2 plants. Formation of the European Vinyls Corporation (EVC), a joint venture between ICI and Enichem, which takes control of the VMC and PVC plants in the UK (and other countries). ICI builds the EDC1 plant, a second reactor (EDC2) is added a couple of years later. ICI constructs the VCM plant. The mercury cell rooms for the production of chlorine and caustic soda are commissioned and the ethylene import pipeline is installed. Formation of Imperial Chemical Industries (ICI) which takes over ownership of the Runcorn site. Chemical production begins at Runcorn on the Rocksavage part of the site. Early production focuses on soap, alkali and sulphuric acid. Vynova Runcorn operates with respect towards the environment and with consideration towards the health of our employees and communities by implementing safe manufacturing processes. Our commitment to quality, safety and environmental accountability is summed up in the Vynova Safety, Health, Environment and Quality (SHEQ) policy, which you can consult on the dedicated page. Vynova Runcorn, along with the other chemical operators on the Runcorn site, actively participates in responsible SHE (Safety, Health and Environment) management by providing the community with safety information and precautionary instructions in the event of a plant emergency. The site’s combined off-site emergency response programme sends out important safety information and instructions at least every five years to residents and businesses within a set distance from the Runcorn site. Information issued to local residents in the Public Information Zone for the Runcorn site includes a Safety Advice Card and Letters to Residents. Are you a contractor or supplier for Vynova Runcorn? Here you will find useful documents and guidelines. Also, please regard the safety-related documentation included in our Safety, Health, Environment and Quality (SHEQ) section above. At Vynova Runcorn, we value the commitment of our employees and the vital role they play in our success. We invite you to discover the different job opportunities at our site via the button below. If there are no vacancies published at the moment, you can submit a spontaneous application. 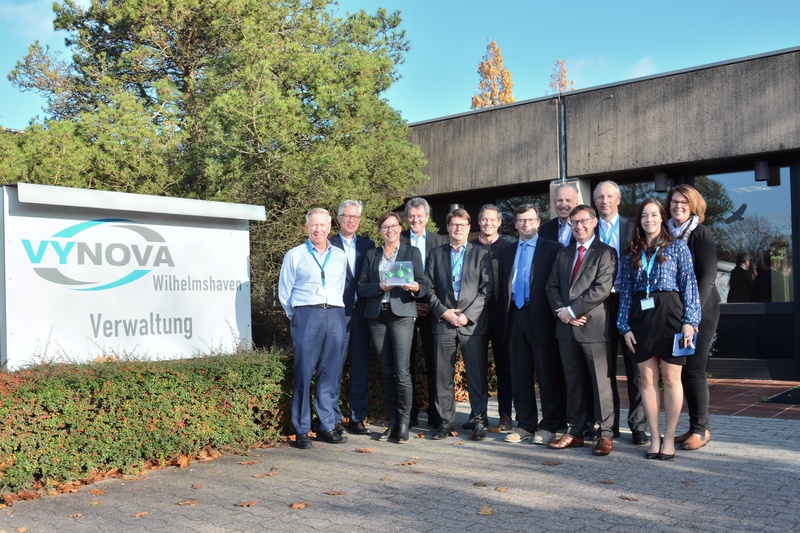 Representatives of the Polymers for Europe Alliance travelled to Vynova’s site at Wilhelmshaven (Germany), to present the new criteria for the upcoming Best Polymer Producers Awards for Europe, and to discuss the future of the industry. The visit facilitated a productive exchange on the state of the polymer industry, best practices, and the future of polymer production. DO YOU HAVE ANY QUESTIONS ABOUT VYNOVA RUNCORN? Please contact us via our online form and we will provide you with a prompt response.